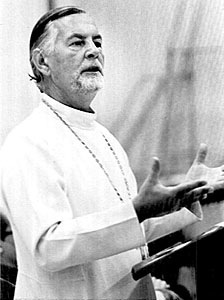 On this Thanksgiving Day, I’m reminded of a remarkable man who was my teacher at St. Vladimir’s Orthodox Theological Seminary: Father Alexander Schmemann. So I want to share a 30-minute video produced by CBS to mark the death of Fr. Alexander on December 13th, 1983. This video is not only a remarkable memorial to Fr. Alexander, but it also opens our minds and hearts to the essence of our Orthodox faith. I thoroughly recommend watching it for the entire 30 minutes. Around the 22-minute mark of this video, the narrator, Fr. 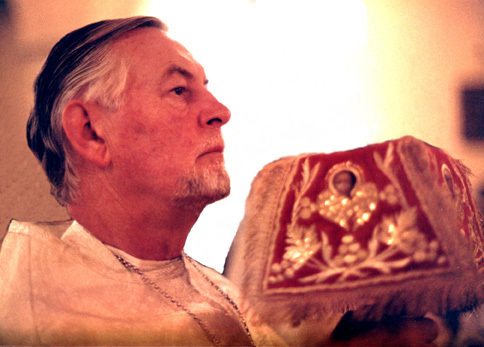 Thomas Hopko, recalls the last Liturgy that Fr. Alexander celebrated, on Thanksgiving Day 1983, just three weeks before his death. He gave a short sermon at that Liturgy that began with these words:”Everyone capable of thanksgiving is capable of salvation and eternal joy.” And he ended the sermon with the words, “Lord, it is good to be here.” Those are the words of a “free man in Christ,” as Prof. Veselin Kesich called him in the funeral oration he delivered (13-minute mark in this video). Fr. Alexander did more to restore Liturgy to its full meaning and beauty than any other man of God in the past 1,000 years or more! Is that a bold statement to make? Perhaps it is, but it is my conviction that if we Orthodox of today have moved beyond passive and mechanical participation in the Liturgy it is because of Fr. Alexander. He is the inspiration for my own approach to Liturgy and the freedom that I find within the holy tradition of the Orthodox Church. It is within the Liturgy that I most vividly remember Fr. Alexander. Here is a picture of him at the Great Entrance of the Liturgy, carrying the holy gifts. I took this picture when I was a student at St. Vladimir’s and it has been widely circulated and reproduced in the past 30+ years. Fr. Alexander celebrating the Divine Liturgy at St. Vladimir’s Seminary Chapel in the early 1980s. Categories: Uncategorized | Tags: Alexander Schmemann, Thanksgiving | Permalink.